Shafiq Husayn grew up in Oakland, Watts, South Central, Texas and the South Bronx where he experienced Hip Hop in it’s infancy, joined Zulu Nation and ran with pioneers Afrika Bambatta and Afrika Islam. In the mid-90’s, Taz Arnold paid a visit to LA with a CD of Dilla beats. After hearing it, Shafiq insisted they join and create a movement – Sa-Ra Creative Partners Production Company. Sa-Ra translates to “the children of the powerful and infinite force in the universe.” Om’Mas Keith joined the group, adding his musicality and multi-instrumental talents. In 2007 Shafiq began working on Shafiq En’ A-Free-Ka, fleshing out existing beats and creating new music. ‘Ka’ refers to the spirit in the Kemetic language. 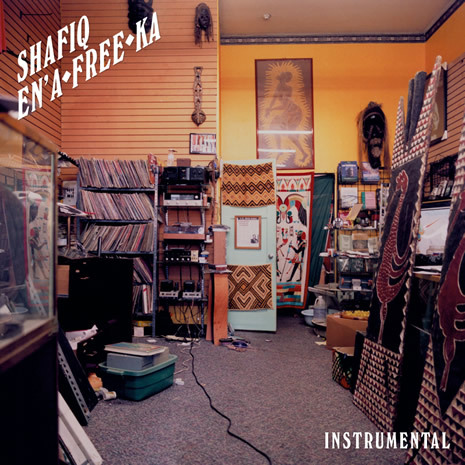 Shafiq En’ A-Free-Ka represents Shafiq in a state of mental and spiritual freedom that is in turn reflected in the music. Shafiq Husayn has always maintained innovation and growth as his purpose and focus. From producing with Ice-T to penning songs for Erykah Badu to innovating as part of Sa-Ra and now creating his own music, Shafiq Husayn strives to convey who he is through his music.